Ranger tug!! Well, at Yachtbedding.com, we are proud to declare we carry each and every pattern of all the Ranger Tugs models out there. If you are looking around to make your Ranger Tug beds more comfortable and desirable, then your search stops right here. Visit our website and have a look at our Ranger Tug section on our homepage. Our Topper System was designed to increase comfort, make the task of making the bed easier and keep your boat looking ship shape. Our 3″ topper will sit directly on your existing cushions, our custom sheet set will fit onto the topper and the custom quilted bedspread will lay right on top. 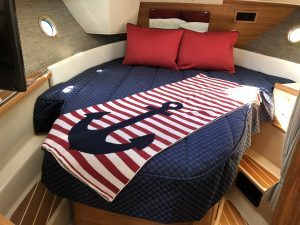 And that’s what we did for this Ranger Tug 29 S. The image shows our 3-piece topper system and then we added the shams and throw blanket to complete the look! The great benefit of our 3” topper is that it will give you the extra comfort you have been looking for and the beauty of our custom sheets is that they fit right onto the topper. No hassle at all! Our quilted coverlet is designed to fit perfectly and the drop creates the look you have been desiring for. For this R 29S, we have used our Full Circle Navy and Full Circle Red fabrics to create the complementary design our client wanted and the anchor blanket as an accent brings the whole design together. We carry a wide range of house fabrics and you can view them on our website. Beiges and browns, greys and platinum, reds and blues, stripes and circles, we have something for everyone. Not to forget my favorite collection of sea fans, corals and sea horse prints in variety of colors! We also carry the Sunbrella collection. Sunbrella is known widely as one of the top performance fabrics these days because of its amazing water repellant and fade resistant qualities. Feel free to contact us if you like any of our fabrics and we will be happy to send swatches your way to make the selection process easier for you. Getting a great night of sleep on your boat has never been easier. With several boat mattress and mattress topper options to choose from, we are able to create a sleeping solution to fit all budgets. Our design team is always available to help you with any inquiries you have regarding your stateroom.